Underwater, the closer we look, the more we see. Slow down, go small and look into the plants and growth. You’ll find surprisingly beautiful and fascinating subjects. 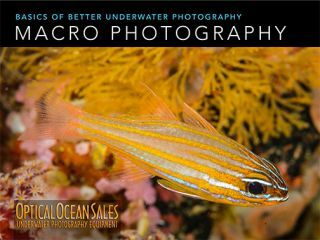 Macro photography allows photographers to get in close, reducing the amount of water between the camera and subject; bringing out color, sharpness and details in photos. 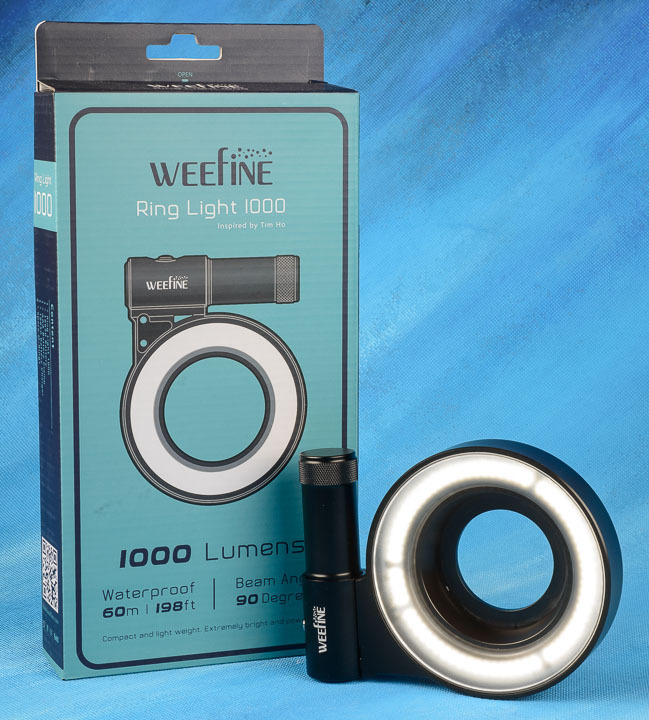 The latest offering from Kraken Sports is the WeeFine Ring Light for macro illumination. 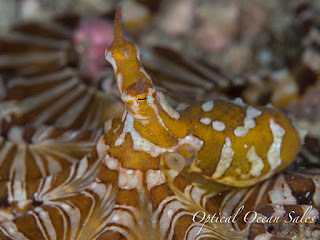 Ring lights offer very even illumination for macro photography by surrounding the subject with a very even light. This innovative light attaches to any threaded port and is similar to ring flashes using strobe lights that have been on the market for a while. However, it features a constant-on 1000 lumen light and is small, lightweight and self-contained. As with all Kraken Sports products, build quality is excellent, with an even, high-quality output and well-designed anodized construction. This ring light is intended for very close-up use. It has a nicely beveled center section that tapers to allow you to put the light over small subjects without hitting them. The battery holder and light swivels on the center section, so you can flip it around out of the way during the dive. By using step up rings, you can attach the light to almost any threaded port. I used it with both an Olympus PT-EP14 (67mm) and TG-4’s PT-056 (52mm) housing easily. It’s 1000 lumen output has three power settings, and comes with a standard 18650 lithium battery and cradle charger. The switch bezel uses colored lights to tell you the remaining battery strength. 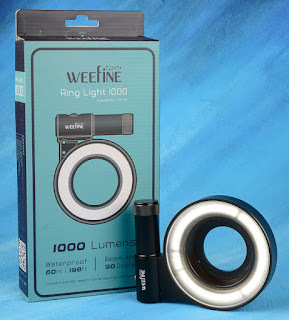 The Weefine Ring Light’s small, self-contained size, and nearly neutral weight, make it ideal for a macro camera rig with bright illumination that is “plug and shoot”, it’s as easy to use as taking photos above water. On our recent Komodo Park dive trip, I shot it with the Olympus E-M1 MKII in the Olympus PT-EP14 housing and 60mm macro lens. 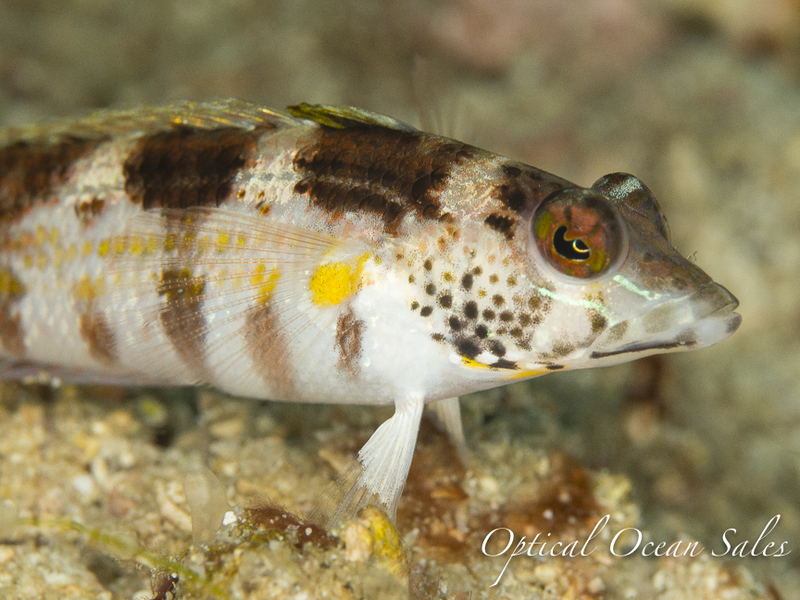 One limitation I ran into is that you cannot add or remove a macro diopter lens underwater. You have to decide above water how much magnification you want to use. I used a +5 diopter, but it might be better to use a +10 or greater and shoot super macro. There has been a lot written about taking photos using constant-on lights. The issue is not only lumen output, but longer exposures. Strobes are designed to put out a tremendous amount of light instantaneously, that freezes motion and gives rich color saturation. A light just doesn’t give the same effect, unless it is very powerful and is used close enough that the color of the water doesn’t affect color temperature. By my eye photos taken with a light as compared to strobes look a bit soft and flat. I found that on the Olympus E-M1 MKII slr, the 1000 lumen power was weaker than I'd like to see for reasonable exposures. I had to use high ISOs along with slow shutter speeds for proper exposure, so image quality and sharpness suffered. 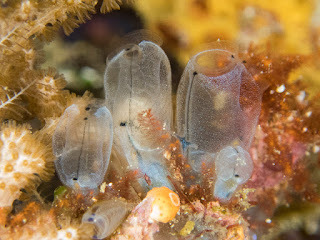 Of course the smaller the subject matter the closer you can get and the better the exposures. Light quality using any ring light is even and flat. This makes the Kraken ideal for scientific captures without shadows, but it’s not a creative lighting source that could add shadows and depth. Trying to tilt it one way or the other just made the shot evenly underexposed on one side. I also shot the ring light with an Olympus TG-4 compact. This camera is well-known for its exceptional macro capability. It has a built-in strobe for macro, but the camera’s Super Microscope mode, that normally uses an LED light on the camera for illumination, is not available when inside a housing. The Kraken Ring Light works great as a substitute. 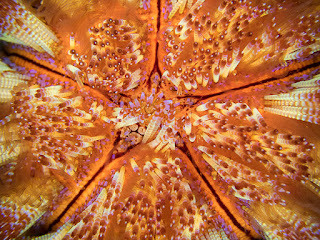 With the Kraken Weefine Ring Light, the TG-4 really came into its own for super macro photos. I used it in Program mode and selected a high aperture. It seemed to work better than the high-resolution E-M1, with a greater exposure latitude. 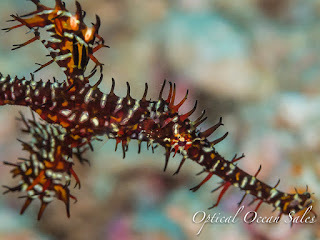 What was nice was that I could carry both two cameras together on a dive. The TG-4 and ring light was so small that I could clip it out of the way, while using the larger E-M1 strobe rig for wide angle, and then be able to switch to the TG4 for macro shots. I could easily place into tight spots that the bigger camera couldn't reach. You can use the TG-4 to shoot more normal shots but you can't zoom all the way out to the widest lens setting. 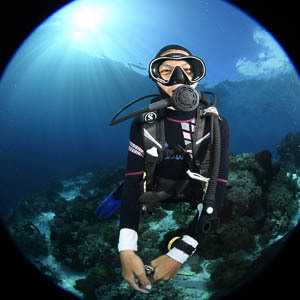 As such also you cannot use underwater Wide 1 mode which fixes zoom. The ring light obviously wouldn't work for illumination for those types of shots. The constant-on light would also be good for macro video use, although I didn’t get a chance to test it. To get modest exposure times, I had to use the light on full power. I was only using a standard 1100mha battery on a prototype unit. As such, battery run time on the light was problematic. Even turning it down between shots, I could only get 35 to 40 minutes from the light. This should be improved on the production model as Kraken will ship the light with a larger capacity battery. In the end, I found that at 1000 lumens it’s not strong enough for SLRs without compromising image quality. For the best quality stills with any camera, a high intensity strobe will always give better results, however, they are larger and more expensive. For video, we normally recommend a minimum of 1200 lumens, so it’s dimmer most video lights. I think the Kraken Weefine Ring Light is a small and relatively inexpensive ($229) lighting solution for macro photography, that produces decent results. Getting even, well-lit, super shots is effortless with it.